Does dropping the SSD in favour of more graphical grunt get you more performance? Attention all you pigeons out there, let me introduce to you the PC-shaped cat from relative system integrator n00b Vibox. There are two rigs in this group test that have thrown all their eggs in the gaming performance basket: this Boss XS and the YOYOTech Fi7epower PCF. 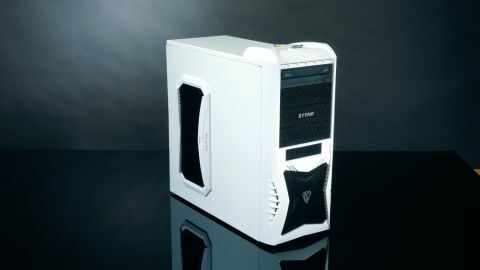 The top-end pairing of the Core i7-3770K and the Nvidia GTX 680 make this an incredibly formidable gaming PC. Starting with the overclocked Core i7 CPU, you have essentially the finest example of Intel's desktop processor pedigree. With eight full Hyperthreaded threads of processing power, it puts the quad-core i5 to shame in any straight-line CPU test. In the Cinebench and X264 encoding tests, the Hyperthreaded i7 in the Vibox machine is over 20 per cent faster than the quickest overclocked i5 rig. If you're looking at any productivity apps, most of them will benefi t from this extra processing power. Video and photo editing will both take the extra threads on offer and use them to their fullest. But this is a gaming PC first and foremost, right? Most game engines don't really benefit a whole heap from a processor with extra threads, and while that may change going forward, this i7 is not really going to translate into faster frame rates in-game. Vibox still has you covered though, as it's included Nvidia's fastest ever gaming graphics card, the Kepler-powered GTX 680. It's a lightning fast GPU that will chew through all but the most compute-focused game engines. The Boss XS houses a stock-clocked card, and while that means in a lot of the gaming benchmarks, it's not a whole lot faster than a GTX 670 - especially the overclocked cards - it has a little more to offer itself. The issue is that after spending a grand on a rig, you don't want to start messing around with clockspeeds and risk borking both your card and your warranty. So, was it really worth Vibox dropping in the GTX 680 instead of a GTX 670? Saving a little extra cash by opting for the marginally slower GPU would have meant it could add a small SSD as a Smart Response caching drive or simple boot drive. As it is, Vibox has chosen a straight hard drive as the only storage option in the rig. As we alluded to when we discussed the Scan rig and its chunky SSD, once you're in-game you'd be hard pushed to notice the difference when you've got speedy frame rates. Where the Boss XS falls over is that it hasn't gone for a SATA 6Gbps HDD. Instead, Vibox has dropped a snail-paced SATA 3Gbps drive in the system. With a 40-second boot time, and very noticeable speed difference in game boots and navigation, this may well be a cut too far. The CPU may give it the win in processing terms, but the overclocked HD 7970 wins the gaming battle and the slow hard drive does make for a rather sluggish-feeling rig. Of less concern is the fugly chassis. When it's hidden under the desk I don't care what my rig looks like, and dropping in a cheap SSD later on would give a whole different outlook to this machine. On balance, the Boss XS is just a little too skewed in one direction.